(NaturalHealth365) We all know that eating fruits and vegetables is good for your health. Now new research out of Harvard Medical School is confirming that eating more berries can contribute greatly to heart health. In fact, blueberries and strawberries (in particular) contribute dramatically to this area of health, lowering the risk of a heart attack. For the study, health data came from 93,600 women who had signed up for the Nurses’ Health Study from ages 25 to 42. Over 18 years, they gave information regarding their diet. Looking at relatively young women at low risk of heart attack allowed the researchers to see many heart attack risk factors more clearly. The researchers determined women who ate the least strawberries and blueberries were at a higher risk for having a heart attack. Those who ate the highest amounts of these fruits were a full 34 percent less likely to suffer a heart attack. Interestingly, the portion amounts eaten of the berries didn’t seem to affect the positive results. As long as some were eaten regularly, there were positive heart health benefits. It seemed that eating them on a regular basis caused a sort of ‘threshold effect.’ However, those studied with the healthiest hearts generally ate at least three servings per week of a combined cup of the fruits. You may be wondering, why do these fruits offer such value? Blueberries and strawberries are rich in chemical compounds called anthocyanins, which are a type of flavonoids. In addition to antioxidant benefits, these key compounds help to lower blood pressure as well as cause the blood vessels to become more flexible. 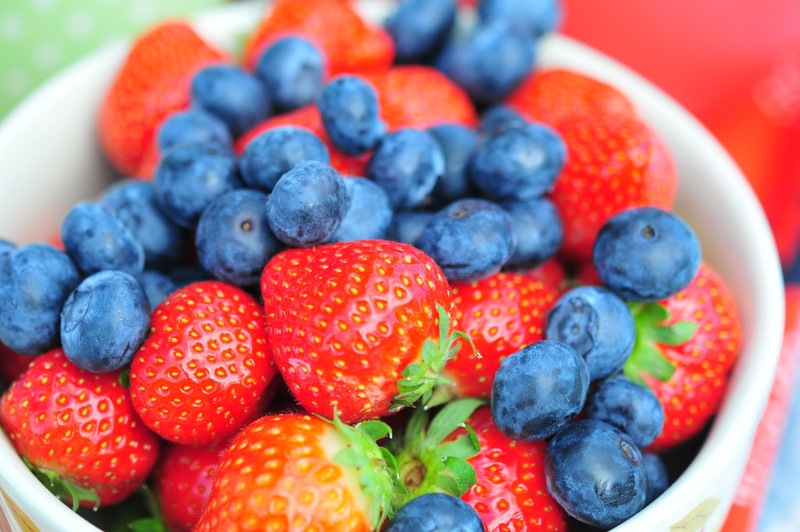 The researchers add that the key flavonoids in strawberries and blueberries work best in the body when they come from whole foods and food-based nutritional supplement. When it comes to nutrition, it’s always best to choose organic for the obvious value of: higher nutritional content and absence of unwanted chemicals. This serves as a reminder to all of us to include blueberries and strawberries on our list when we go to the grocery store. Of course, blueberries (alone) have long been considered a superfood that brings tremendous antioxidant and anti-cancer effects to the body. Both strawberries and blueberries are excellent for breakfast either plain or served with your favorite (organic) cereal. In addition, you can try them in green salads along with a sprinkle of chopped sprouted nuts for the added value of healthy fats. Remember to strive for at least three portions of these health-sustaining foods – each week – for best heart health results. And, finally, berries are a delicious add-on when blended into your favorite smoothie. An easy, nutritious smoothie recipe is as follows: Blend 2 scoops of Whey Protein into 8 oz. of your favorite non-dairy beverage, organic juice or your favorite smoothie recipe with 1 cup of blueberries and/or strawberries. (adjust quantities for desired taste and texture) Blend, serve and enjoy!